When McKenzie Young was in high school, she remembers being "the kid in the back of the class who had a sketchbook." "As a kid I was drawing all the time," the 22-year-old said. "My parents are both fairly creative people. My dad would help me learn how to draw things and they would supply me with art supplies. It's just something that became natural for me." The Bellingham, Wash., native described herself as a "self-taught" artist, saying it was part of her daily life. Before she came to George Fox University, where she is now a senior, she said she didn't know much about illustration, although she was drawn to the "illustrative children's book style." "I was an avid reader as a kid and those images stuck with me," she said. 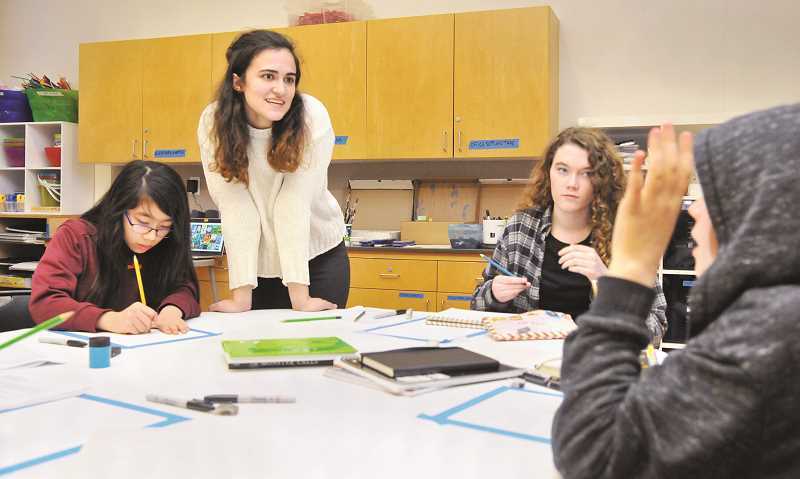 Young, who initially planned to study graphic design at GFU, said she realized she "wanted something a bit more traditional," which is when she found she could "pursue illustration as a career." "That's exactly what I want to do," she said. Young, who teaches illustration courses to middle and high school students weekly at the Chehalem Cultural Center, has now turned that passion into a budding career. She's working on a couple of projects, one which she said is close to being released and another which will be in the future. Those projects? The very thing that stuck with her: children's books. "It was a little bit surreal to have someone come to me and say 'Can you illustrate my children's book?" she said. "It's been such a cool experience to have that kind of communication with an author and collaborate. It's been a really cool start for what is hopefully my career." Now for her second semester, Young will be teaching the skills she has learned to students at the Chehalem Cultural Center. She said the class, which is five weeks long, has brought in students from ages 12 to 18 before and she characterized the group as a fun mix to work with. She said the class covers the basics of illustration; they don't have the time to do deep dives into more technical aspects or the business side of things. "I'm just trying to convey (that) they can be storytellers and that they are storytellers with interesting stories to tell," she said. The message, and basics, of illustration she wants to convey is that if they tell their story, people will listen. "If they have that they can learn the technical skills to keep on going," she said. In the class, she said students work on a variety of different projects. There are smaller, one-time projects, such as recreating a book cover or coming up with a character, but there is also an overarching project students do throughout the class where they create a series of five images. "The student work has been really impressive," she said. "It makes me excited every time I teach them."